Not an awful lot has been revealed plot-wise thus far, but this is not a bad thing in this case. So far, the main character, Toko, goes to watch fireworks with her friends during the summer break of their senior year at high school. They seem to express some trepidation that their lives are about to change and they may be separated after graduation. Toko draws a lot, so I’m assuming that she wants to be some sort of artist. Anyway, one day while she is drawing, she has a rather strange encounter with a transfer student named Kakeru. Towards the end of the episode, he claims that a voice from the future talks to him and led him to her. While the artwork in the series does resemble contemporary anime, the characters are really uniquely drawn, more like the style of older anime. They don’t look generic at all, which is worth a million praises in this era. 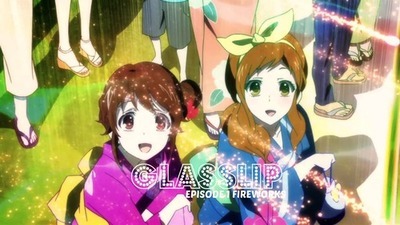 Between this and the skillfully crafted exposition, Glasslip is looking to be a very promising series. Hopefully it will not disappoint.